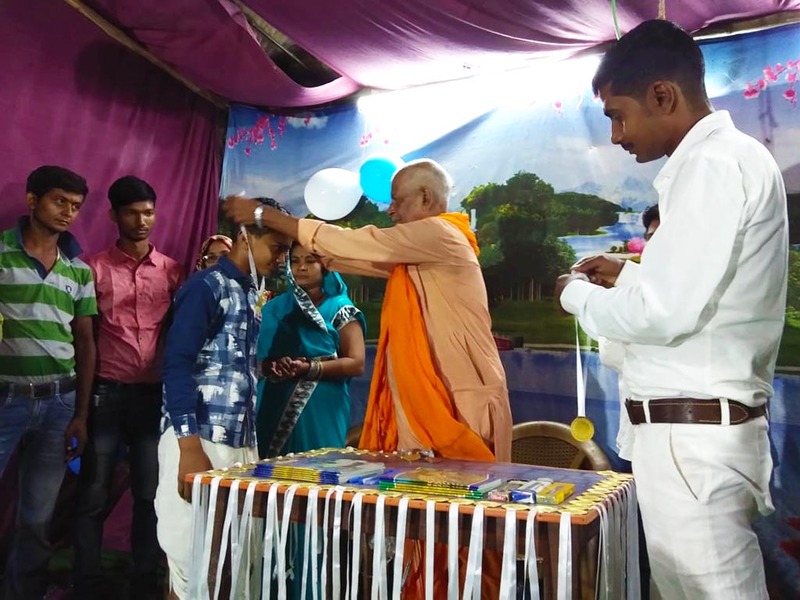 Over 50 children got awarded for their contribution to Swachhata Hi Seva 2018 in Bihar villages on last day of Navaratri. Under the leadership of village coordinator Nandikishor, all Amrita staff including AMMACHI Labs community organizer and Amrita CREATE tuition teacher set the plan for 18 days of cleaning campaign. During the campaign these children keenly gathered to agreed on a place every day and cleaned along with Amrita staff – whether it was a schoolyard, a public drain that goes through the village, or the pathways. “This is the result of four years of work in the village on cleanliness awareness. We have conducted awareness session in schools, public meetings and home visits. Also we have organized rallies and regular cleaning sessions during these years. That’s why the children were so eagerly participating. They know the benefit of cleanliness,” comments Nandikishor. On Vijaya Dashami celebrations the whole village was present when the medals, notebooks and pens were handed over by Pradhan Manju Singh to the most exemplary children. Last year Bihar villages were announced open defecation free under Swacch Bharat Mission.